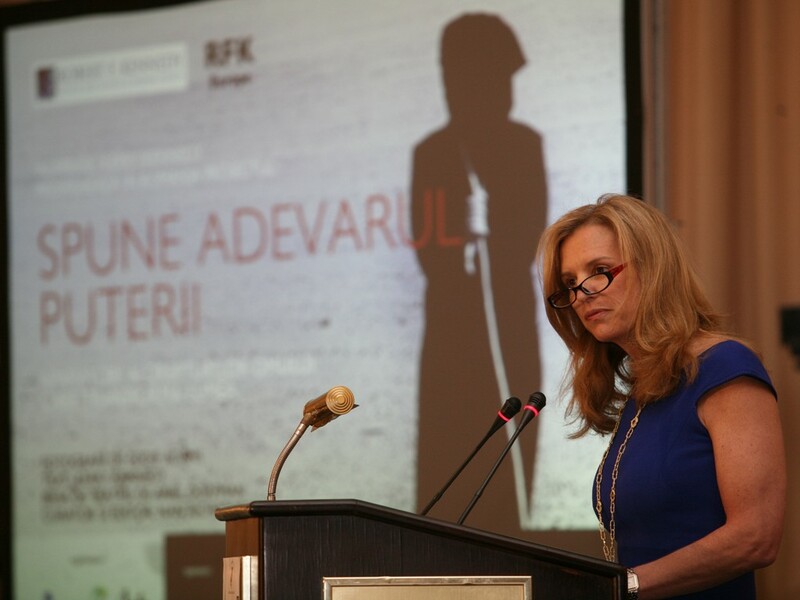 Kerry Kennedy, daughter of Robert F. Kennedy came on the 7th-9th of April for the first time in Romania to promote the Speak Truth to Power project, an initiative that promotes human rights, initiated by the Robert F. Kennedy Center for Justice and Human Rights and the Robert F. Kennedy Foundation of Europe. This project includes the „Speak Truth to Power” symposium dedicated to promoting human rights. The symposium is organized under the patronage of the Romanian Senate, in collaboration with Robert F. Kennedy Foundation Europe, Thursday, April 9th, 2009, at the JW Marriott Bucharest Grand Hotel, Constanta Room, at 09:00. The first part of the symposium focused on the importance of human rights advocacy. After a brief introduction by Kerry Kennedy, the floor was given to Doru Costea, State Secretary of the Ministry of Foreign Affairs, Gabor Gombos, Hungarian human rights defender for persons with mental disabilities, Marina Pisklakova-Parker, Russian human rights defender against domestic violence, Dr. Michael Korzinski director and co-founder of the Helen Bamber Foundation UK, Iulia Motoc, a member of the Committee for Human Rights and a lawyer. The session was moderated by Mircea Toma, president of the Active Watch Agency- Media Monitoring Agency and member of Transparency International. The second part of the symposium was dedicated to women’s rights in Romania, with a particular focus on trafficking of women, domestic violence and problems faced by the Roma women. A short introduction was made by Andreea Marin Banica, Goodwill Ambassador for UNICEF in Romania. Thereafter, the floor was taken by Iana Matei, Director and Founder of the Reaching Out Foundation, Magda Matache, Director Executive of Romani CRISS foundation and Cristina Horia, Executive Director of Sensiblu Foundation. The session was moderated by Mihaela Miroiu, professor at the National School of Political Studies and Public Administration in Bucharest.